Wayne, Pa. (December 8, 2017) —Dolco Packaging, a Tekni-Plex business unit, is among this year’s sponsors of the annual Festival of Trees, the signature fundraising event for the Embassy Theater Foundation in Fort Wayne, Indiana. Begun in 1984, The Festival of Trees has attracted more than 18,000 visitors annually to the Embassy Theatre and has become a popular Northeast Indiana holiday destination. Its goal is to raise funds to support operations and restoration efforts for the historic Embassy Theater. 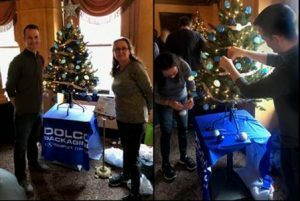 The Dolco Packaging plant in Decatur, Indiana, lent its support to the event by sponsoring and decorating one of the many trees that adorn the theater during the festival. “This is such an important event for our community because families visit annually to celebrate the holidays and create memories that will be remembered for years to come. Our employees wanted to support the event by donating their time and decorating skills. We also raffled off tickets to the Festival of Trees, so our employees and their families could experience the winter wonderland for themselves,” said Jim Baumgartner, Dolco plant manager.